This issue of Thoracic Surgery Clinics covers the management of benign and malignant pleural effusions. 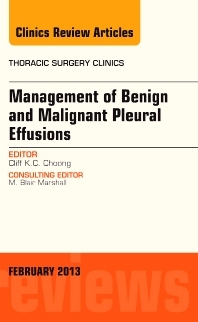 Expert authors review the most current information available about decision making in the management of pleural effusion, management of hemothorax, surgical management of malignant pleural effusion, surgical treatment of malignant mesothelioma, and more. Keep up-to-the-minute with the latest developments in this important aspect of thoracic surgery practice.